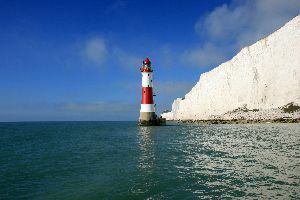 The 8th October was my birthday, and what a birthday it was to be, I was going to get the opportunity to visit the Beachy Head Lighthouse. 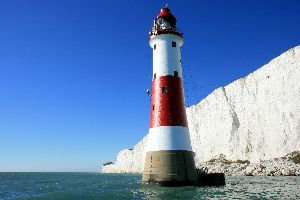 Having researched the lighthouse in so much detail and written The Story about the Beachy Head Lighthouse, a historical account from construction through to automation in the 1980’s, it was always my dream that one day I would be able to set foot inside the lighthouse, and today was the day. Cleaning were there, together with Gareth a Press Association photographer and Ellie and her cameraman from BBC Breakfast television news. It was also a big day for Shirley Moth, Elaine and Mike from the Save the Stripes team. It was a cloudy morning, but as we set off the clouds dispersed and we were treated to absolutely glorious weather, it was like a summers day. As we approached the lighthouse looked so bright and ‘shiny’, very eye-catching, just the ticket for a lighthouse and a ‘day marker’. The guys were busy working on the third and final coat of paint. 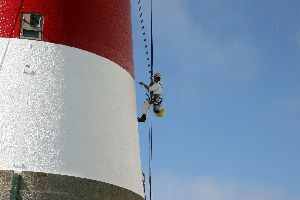 The paint had been applied using spray guns and they were also in the final stages of adding the edging using rollers. 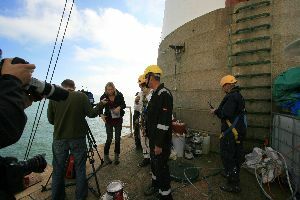 We came alongside the lighthouse and climbed the ladder to the landing platform unloading our camera bags and the BBC with all their camera equipment. The generator was clattering away powering the spray gun as red paint was still being applied. 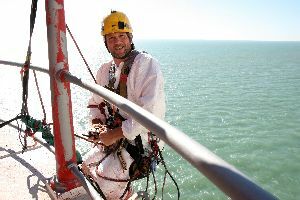 Hugh, one of the abseil painters was applying the edges to the lines and came down off the ropes. 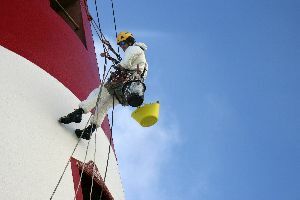 He was fitted with a helmet mounted camera as the BBC wanted to get a ‘birds eye’ view of what it was like to dangle off the side of a lighthouse. As the lighthouse is quite cramped inside, Shirley, Mike and Elaine were going to go in for the first look, led up the ladder and into the lighthouse by Sam as the rest of us waited on the landing platform. The generator had since been turned off and Hugh was still being fitted with his helmet camera which was held on by gaffer tape. A while later Shirley, Mike and Elaine appeared with huge beaming smiles on their faces. Now it was my turn. The ladder up to the front door is made of iron with hand holds. Carefully, one rung at a time I ascended the ladder and was in the entrance hall. The toilet is on this level. The stair case is very narrow and very steep. It makes you realise that you probably couldn’t get anywhere fast in the lighthouse. Going down stairs would definitely be easier and safer backwards. The stairs follow the curvature of the wall up to the next level you reach the backup generator. The next floor up from that is the oil tanks and shower. 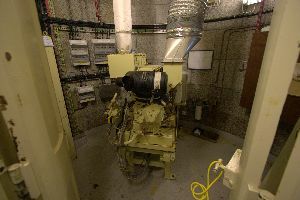 The next floor has a room containing batteries, various electronic equipment and a freezer which the crew were using for their frozen dinners. 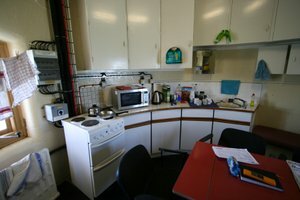 Then above that we have the kitchen, complete with cooker from the 70s, it did however have a microwave. There was a DVD player with a selection of DVDs but much to the disappointment of the crew the TV had broken. They had to make their own entertainment and read or listen to the radio. Which I think is quite actually quite symbolic as that is just what the original keepers would have had to have done all those years earlier. On the next floor we have the bedroom. 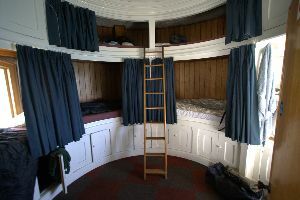 There are three bunks following the curve of the tower. In addition two cupboards above have been converted into extra beds. It was very cosy. On the next floor we have the watch room. This has a steel tube with a chain inside that would have held the weight that drove the original clockwork mechanism. It has telemetry equipment and various other instruments. Then as we ascend the next steps which gets narrower at the top we have the lantern. 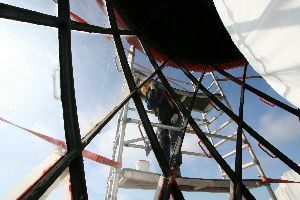 The optics are covered up these days which is necessary to prevent fire from the suns rays being magnified by the optics. A door leads out to the balcony around the lantern room where we got the most amazing view of Beachy Head. We were able to see Hugh and Ian put on their harnesses and then climb over the railing to continue painting. It was such a great opportunity to see the work being finished from this perspective. After more time than I expected to wander around, take photos and ponder about what life must have been like as a keeper we then had to leave. We said our goodbyes to the lovely crew and boarded the boat. 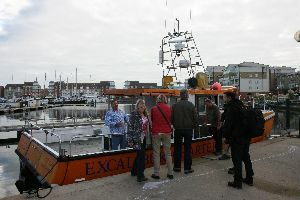 We had one final chance for some more photos and then we sailed back to Sovereign Harbour, basking in the sun on the the back of the boat. I can’t believe how lucky we were with the weather, but I can’t believe how lucky I am to literally have a dream come true. It was such the most special day. Having researched the lighthouse in detail, written about it and seen pictures of the inside and how the keepers lived I was already very familiar with it, but to actually step foot inside and experience it for myself was very special indeed. 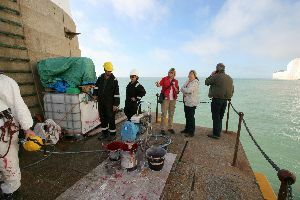 Thank you to Martin from Sussex Blast Cleaning for making it happen and for Trinity House in accomodating us. With so much material you have to be a little ruthless and there must have been so much footage on the cutting room floor, including my interview. 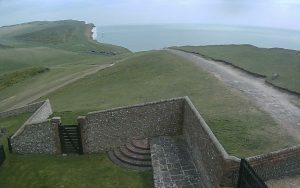 I spoke about the history of the lighthouse and why the Beachy Head Lighthouse is so important. Shame. But the BBC did put together a great piece, especially with Hugh, his interview complete with helmet cam.